Innate optimism and hope are a fundamental part of the activist mindset, even when you are aware that the situation is heavily weighted against success. And having spent the 6 weeks prior to Rio+20 translating Pierre Radanne’s excellent analysis of the process and potential outcomes, I like most others was sceptical as to what could be achieved through the official channels of the UN Summit. The ground rule of achieving consensus has long meant that any truly enlightened forward-thinking policy has failed abysmally to be adopted, and the proposals on the table were progressively voided of all potential to address the climate change issues as the negotiations progressed in the run-up to the event. But after two long weeks in Rio, I have come away with a feeling of some optimism. Let me explain why. As most readers probably know, there were two parallel meetings in Rio: the official Rio+20 UN Conference that was held in the outskirts of Rio, and the People’s Summit that took place in the centre of town, in Flamengo Park. There was also an interface between the two, through the civil society “major groups” and lobbies. Since the first Rio Conference on climate change in 1992, the UN institutions have failed to make much if any progress on this crucial issue. And indeed this conference has produced an agreement that not only fails to show much progress, but is even a regression. But these same twenty years have seen the progressive rise and empowerment of civil society, operating in an increasingly complex organised matrix of sectoral and territorial levels, from local to global. This movement includes the World Social Forum and its thematic axes as well as the more recent Occupy movement. It also includes an increasingly strong element of inter-related and organised social movements. The issues of the current global crisis of our civilisation and that of climate change came together in the People’s Summit in a new and meaningful way, with the real solutions being put forward in a more coherent whole than ever before. My early concerns during the week were how and whether the trend that has emerged through the Social Fora of Converging Assemblies would succeed in providing an overall credible unity of action to continue: there are so many specific cases and causes involved… But as the days progressed, and the atmosphere in Rio Centro, where the official forum was taking place became ever more depressed and depressing, the atmosphere in Flamengo was electric and high in energy of a kind that I have not experienced for many years… Yes, there is a desire to overcome internal differences and take our destiny in our own hands to act…. The obvious paths that have emerged are those of the local rights-based inter-connected actions to impact our societies where we live, and transition to more sustainable societies at all levels. These are no longer isolated projects, but a more aware global movement. It includes all the key sectors: agriculture, through agro-ecology small-scale family farming and Community Supported Agriculture coupled with the defence of traditional seeds and plants against patents and biopiracy, land reform and the massive defence of the Commons, alternative economic solutions carried forward by the different dimensions of solidarity economy (largely thanks to the Brazilian Forum for Solidarity Economy), no longer a solution to “fix what is broken” but to provide people-centred genuine alternatives… The Via Campesina and Brazilian Landless People’s Movement (MST) were amazingly present, as were the World March of Women, the Trade Unions and many smaller organisations that defend the Commons and people’s social rights. The culmination of the People’s Summit was an 80,000 person-strong loud but peaceful march through the streets of Rio… I believe it was the biggest demonstration in which I have ever taken part. And the many excellent declarations carried forward to the UN Secretary General and the world at large. Yes, the greed of neo-liberal interests is influencing countries such as the United States, Canada and Australia to veto all binding progressive agreements that could oblige society to reduce dependence on fossil fuels and growth-oriented production. Yes, the developing BRIC countries (Brazil, India and China) are arguing forcibly in favour of their right to develop along similar lines to those countries that have done so in the past. But I feel that we must not underestimate the combined power and determination of civil society as organised in social movements to take things into their own hands and act at joined-up local level, and to bring bottom-up pressure to bear on governments, as well as to lobby top-down through the relevant institutions to take the required measures to change our society before it is too late. These changes will need to address all dimensions of society: not only the energy issue, but also modes of production and consumption, social issues and human rights. We need to learn to change our collective approach to how we live in society. 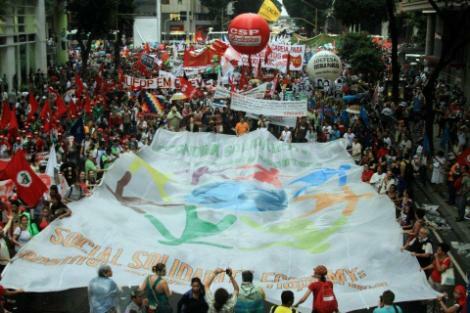 And the values of the various social movements present at the People’s Summit carry a very clear and determined message. Never has such a coherent message been delivered collectively by civil society to the governments of the world and UN institutions. « RIO+20 extended » : On June 20th 2012, three hours of dialogue between members of civil society showcased the users expertise of practicians. The project of Rio+20 extended is to build relationships between “here and “there”: “Here refers to the territories where we live in France, and indeed in Europe - a community of shared destiny and of political citizenship; there are the long-distance relationships that translate our global citizenship into the future” 1. The European P’Actes, who are members of the Rio+20 Collective organised a meeting in France on June 20th, called “Acts and projects for territorial anchoring and democratic participation in sustainable development”, using communication technology and freeware. Five territories in five different regions of France took part, with horizontal exchange between peers. A sixth region, Brittany, connected to the Rio State Pavillion in the Athletes Park and hosted a delegation of youth from the Ligue de l’Enseignement. Why focus on user’s expertise? Because practitioners’ opinions are rarely heard, and in the multitude of voices, the Local is fundamentally observed from on high. And if the Local and the global are indeed interdependant, it is at local level that things are happening : they are both highly complex… and very concrete! The event planned to demonstrate how citizen-actors (inhabitants, associations, elected representatives, entrepreneurs, trade unionists and researchers) are all collectively involved on a daily basis in various field actions that have generated concrete results, trust, and users’ expertise. This intellectual capital can be multipled and shared; by learning to cooperate they are the prefiguration of paths towards a democratic transition at social, economic and ecological levels. The presentations illustrated the approach and results, without hiding the challenges, so that lessons could be learned for the future. Issues of transition were included via renewable energies, land, food, employment and networking methods. What participation in the territorial management of daily issues? What governance at multiple levels? The objective was to help solutions to be disseminated at a more general level in France, Europe and in the post-Rio period. There are a considerable number of problems, the number of unemployed is huge. This is a subject of great debate, as everyone is singing from their own song-sheet, and trying to develop their own growth potential. Reconciling democracy and environment means confronting serious risks. Recognition of territorial space is one of the keys to the solution to get things to change in the world. For neither States nor multinationals by themselves are in a position to define balanced relationships, much less implement them. Solidarity means refusing what is unacceptable – both here and there – looking one another straight in the eye. It implies organising resources. It’s not so much the volume as the networking that produces results and helps us to grow. An economy that includes different models and local development are the vectors of change: radical experiments, territory-to-territory cooperation that allows people to learn by doing and make suggestions that are based on examples that have proven effective. The time has come to link actions together, and expand… with the aim of developing our solutions, to dare implement bigger projects to change the course of events…and build Europe. The horizontal organisation of distance communication is relevant to allow citizens who are engaged in actions to share a joint international agenda. The approach stmulates the awareness of interdependence. It underlines the fact that success is singular and based on context, resources and the will to get along with other actors and to jointly look for solutions. It can be used to establish a structured dialogue around objectives, as well as make contact with many different partners working on projects in the same place, and thus reconstitute an intersectoral response in a non-hierarchical manner.